PETALUMA, Calif., March 21, 2019 /PRNewswire/ -- Revive Kombucha™ announced today the nationwide launch of three of its unique flavors - Original Cola, Hibiscus Refresher, and Ginger Lime - in 7-Eleven® stores across the U.S. for $2.99/12 oz. bottle. As a high growth category, kombucha has established a strong millennial consumer base in the natural and specialty channels and most recently expanded into traditional grocery. Revive Kombucha's national launch authorized in up to 8,000 7-Eleven stores across the U.S., marks the largest entrance into the convenience channel for any kombucha brand - a refreshing, better-for-you alternative to soda. Compared to the overall kombucha category, Revive's consumers are younger - under 35 years old - and skew more male*, making Revive the right brand for building the kombucha category in the convenience channel. "In my opinion, Revive Kombucha is hands-down the best tasting kombucha available in the marketplace. 7-Eleven is proud to be the first convenience store to take Revive national to our 8,000 U.S. Stores. 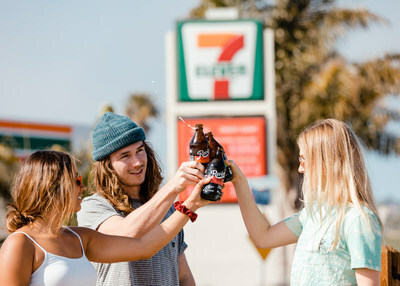 This will make kombucha more accessible for our on-the-go customers, who range from Gen Z to Young Boomers, that are seeking better-for-you beverage alternatives," said Chris Stewart, Senior Category Manager, 7-Eleven. "Currently, 54% of Americans live within 1 mile of a 7-Eleven store. We understand that our customers are looking for a variety of better-for-you beverages and Revive is exactly the functional beverage our customers are demanding." More and more consumers are discovering kombucha's benefits, from improving gut health to immune system support and so much more. However, not all kombucha is created equal. Revive's ability to create a great tasting plus functional beverage makes its appeal much broader. Made with all organic ingredients and traditionally fermented live cultures, Revive kombucha is brewed like a craft beer resulting in smooth, refreshing and lightly effervescent kombucha without a harsh vinegary bite. Revive develops all of their own recipes, techniques and cultures to create their unique brews which are always non-alcoholic and low in calories, sugar and carbs. Original Cola: Revive's OG flavor, this is the brew that changed everything. Original Cola is the foundation, the first brew and represents the flavor of Revive Kombucha. This crisp and smooth black tea brew features a hint of vanilla to leave you feeling refreshed, guilt-free and ready for fun. Hibiscus Refresher: A brew that reminds you of those effortless moments when you're in the groove. Together, the naturally sweet and tart hibiscus flowers awaken with this unique caffeine-free kombucha culture, making for a bright, laid-back, feel-good brew. "7-Eleven has always been a destination for soda. As a guy who grew up in the Midwest with a bad soda habit, I'll never forget the first time my wife handed me a bottle of kombucha to try. At first, I nearly spit it out but then my body began to crave it. I began to quickly feel and see the functional benefits of drinking kombucha. I knew though that there had to be a way to create a super tasty, craveable kombucha that even my own friends and family would drink – and perhaps even replace their soda habits like I did. I was then on a mission to create the best tasting kombucha possible – and it is no accident that our 'Original Cola' was our first brew that really defined our foundation of our flavor innovation and naturally fermented brews," said Sean J. Lovett, Founder and President of Revive Kombucha. "We are thrilled about this new relationship with 7-Eleven. It is the perfect way to expand the kombucha category to a much larger consumer base, which will transform the overall consumption of kombucha in the long-term."